Posted on April 24, 2019 at 4:34 pm. We will have the best range of camellias that we will have for the season as we do sell out of varieties. Most plants are in 140mm pots with a small number in 200mm pots, mostly sasanquas with a few japonicas and hybrids. The sasanquas are flowering now and are putting on a good show – the japonicas will follow in the coming weeks. 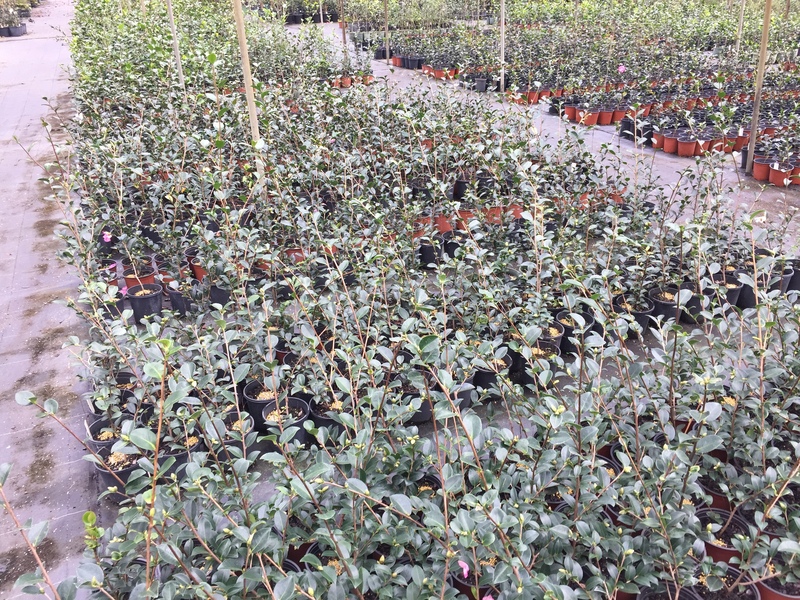 So whether you need one camellia for the garden, a half a dozen for a screen, or a bunch more for a hedge, come visit, see our camellias growing in our garden, and buy some for yours. 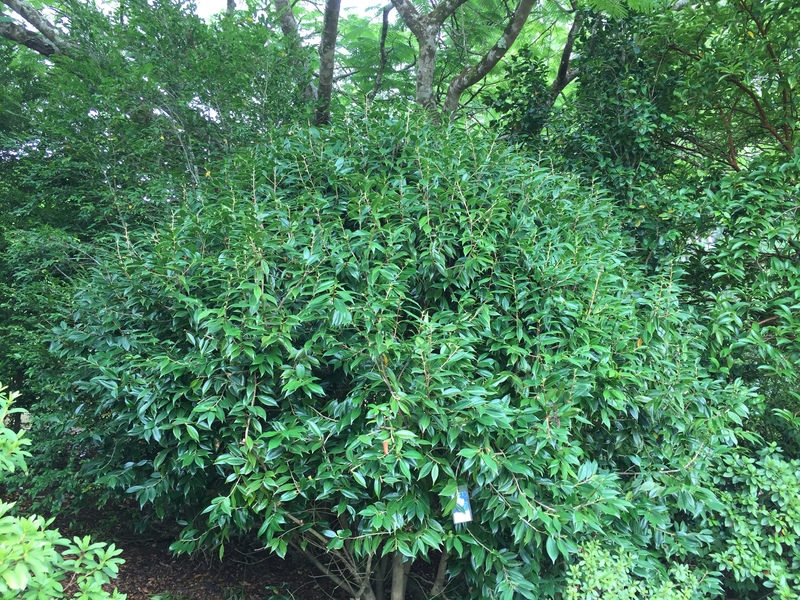 We have about 50 different varieties of sasanqua and some 150 varieties of japonica and hybrids. Ask us about screening/hedging varieties, ask us about our fragrant small leaf hybrids. And remember, sasanquas handle full sun but also perform well in part shade; japonicas – in our climate (SE Queensland) – do best in part shade, as the flowers can burn in our winter sun. See our Culture Notes on this web site. Alba Plena, Minato No Akebono, Pope John XXIII, Betty Ridley, Cherries Jubilee, Drama Girl, Edna Butler, Erin Farmer, Isaribi, Midnight Magic, Paradise Blush, Polar Bear, Scentuous, Shirley Norup, Star Above Star, Tama No Ura, Yuletide ……..
Posted on March 7, 2019 at 8:52 pm. 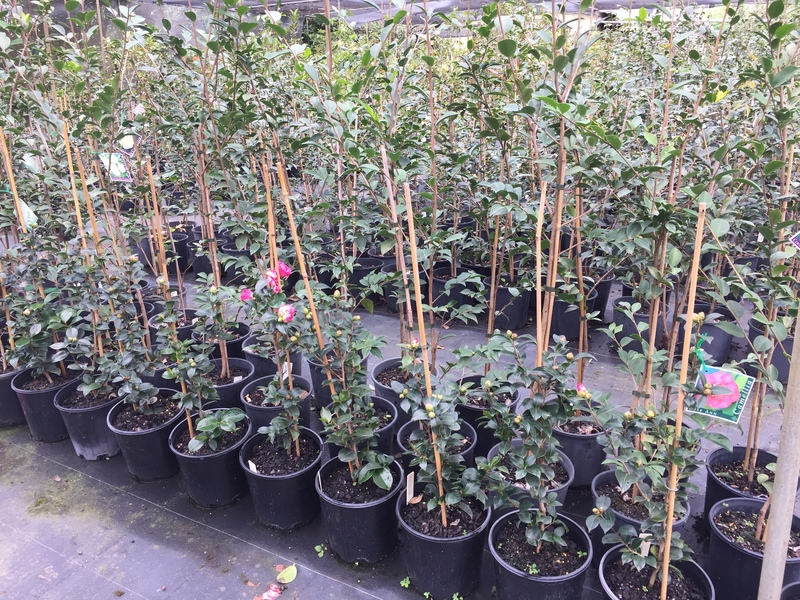 Camellia season is almost upon us here in South East Queensland – so we have been busy tidying our young camellias and making them look as good as possible. Some need staking upright – and this process means that we take a good look at each plant. The ‘Elegans’ family, Elegans, Elegans Champagne, Elegans Splendour and Elegans Supreme, as young plants, are often untidy, with short upright growth with invariably a vigorous branch shooting off at right angles, low on the plant. Tying up the branches can result in them snapping at the trunk. Another aspect that applies to all camellias is that a young plant may decide to put on a flower bud at a early stage, on the leading growth. Once this happens, the plant puts all its energy into developing the flower and as a result, no new growth will happen – until the following season. Ultimately, both plants will grow away the following season. Plant on the left has developed a flower bud. The other has put energy into vegetative growth and is much taller. Posted on February 22, 2019 at 7:57 pm. 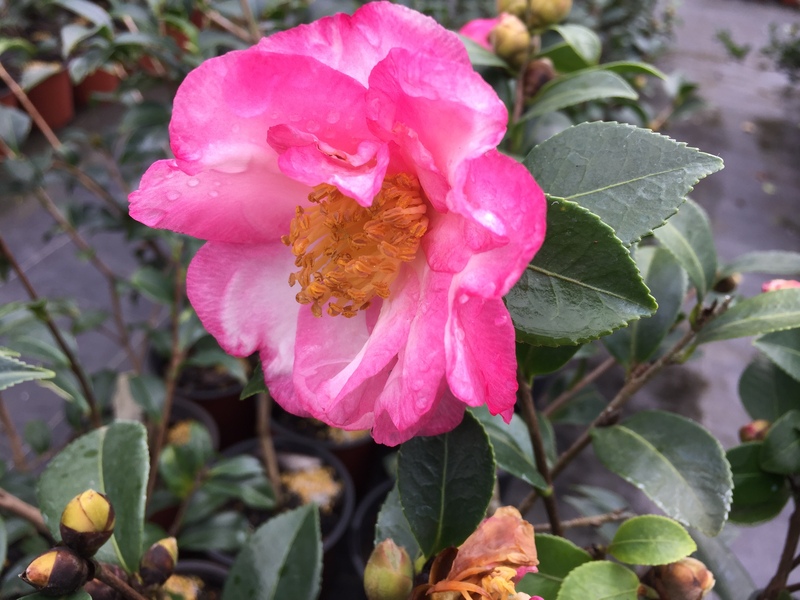 The camellia season is approaching fast – we have a few flowers on early sasanquas like Mikuni Ko, Chojiguruma, Bonanza, Sparkling Burgundy – spot flowers for sure but it is nice to see the colour coming. We plan to have a number of ‘open days’ again this season where folk can visit, wander our garden, check out the 400 or so Camellias in our garden – and perhaps buy one or two for yours. As usual, we are available by appointment at other times – we just ask that you call in advance to make a suitable time. We will also have a number of camellia shows, garden club events etc. that we need to schedule around. Friday 12, Saturday 13 and Sunday 14 July 2019 – Queensland Garden Expo, Nambour Showgrounds. See www.qldgardenexpo.com.au We will be there at site No 295 with the most extensive range of camellias that you are likely to see anywhere. Our nursery will be CLOSED this weekend. CLOSED Friday 19, Saturday 20 and Sunday 21 July. See us at the Toowoomba Camellia Show. CLOSED Friday 26 and Saturday 27 July 2019. See us at Queensland Camellia Society Annual Show and Sale, Mt Coot-tha Botanical Gardens, Brisbane. Sunday 28 July 2019 – Queensland Camellia Society Annual Show and Sale, Mt Coot-tha Botanical Gardens – see us there. We will have an extensive range of camellias available. Also Camellia displays, camellia talks, morning teas/lunches and more. CLOSED Friday 9 and Saturday 10 August 2019 – we are going to have a rest! This will be all of our planned Open Days for this season. As usual, we will continue to be open at arrangement. There are lots to do in the garden at the moment – the mowing, weeding and mulching never seem to finish. But we do get to walk the garden and see the progress of the camellias – the flower buds that are just bursting to pop into colour. Come visit us – wander our garden. 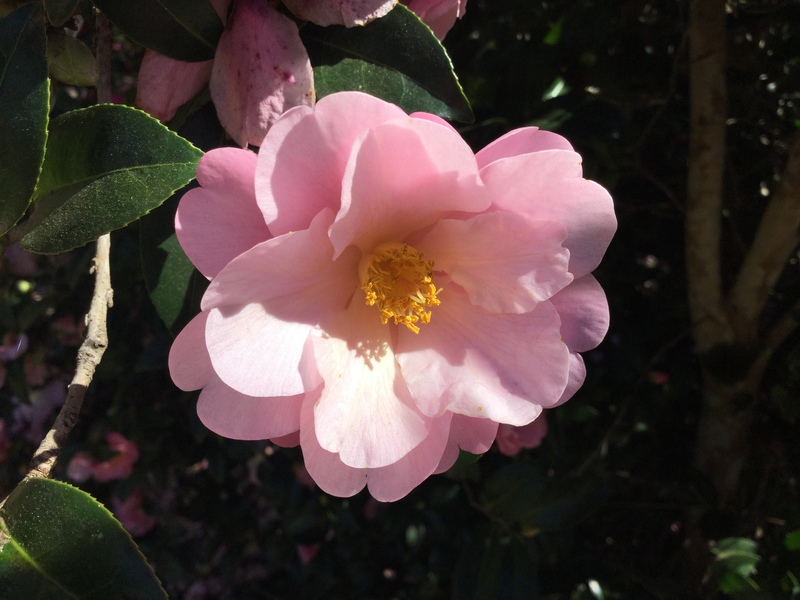 See our camellias in flower – buy some for yours! Posted on February 12, 2019 at 11:04 am. It’s summer – and it has been hot and dry here in SEQueensland. January was reported as being the driest on record. Thankfully, we have been fortunate to have received some 80mm of rain in early February which takes some pressure off the garden plants. 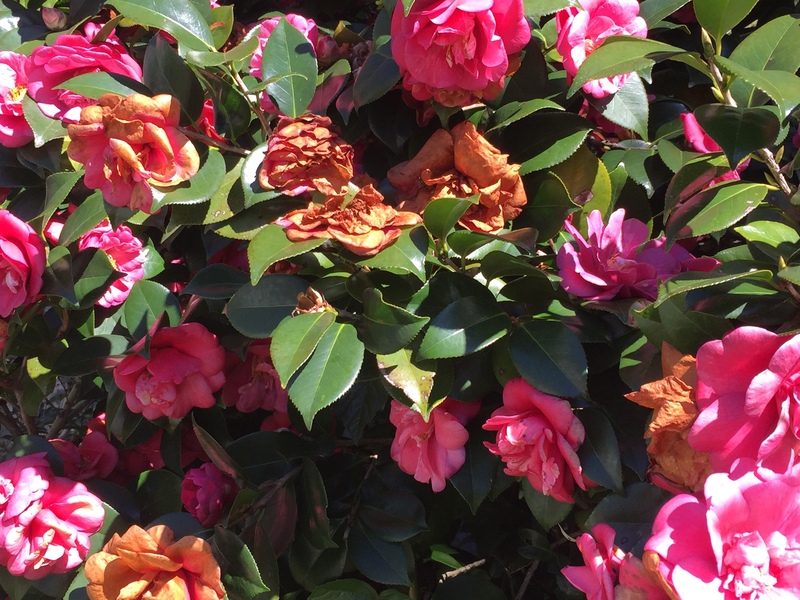 However, some of our camellias have suffered. 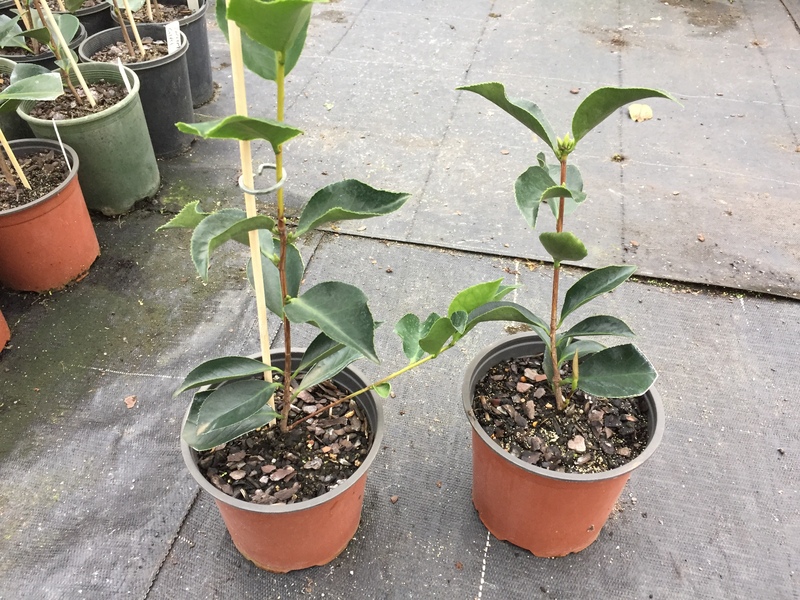 These are the japonicas that are getting too much sun and are getting foliage scorching/ sunburn, and a couple of more newly planted plants suffering from the roots drying out. 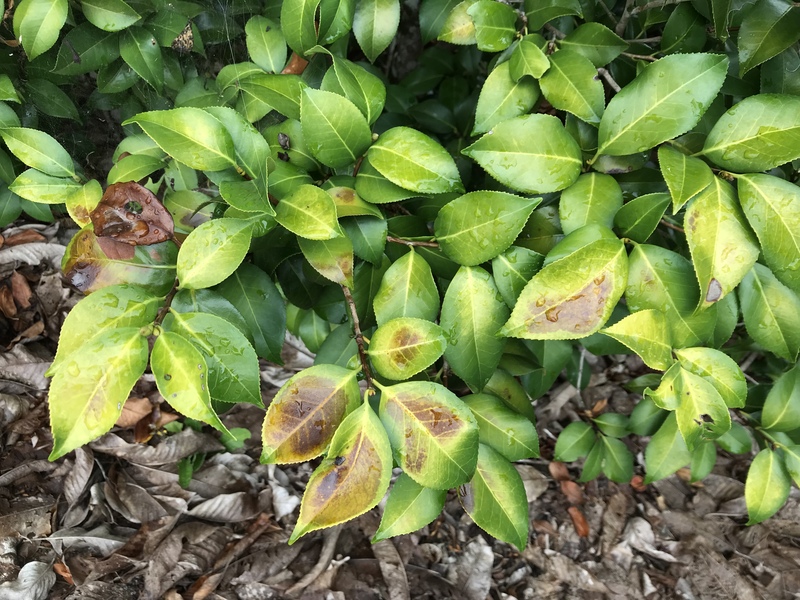 There is little that can be done after the event – these leaves will fall eventually, or you can prune these out, when the weather becomes a little cooler. Keeping water up to plants as well as possible is the best we can do. Otherwise, look at the position and decide whether you are happy to suffer the sunburn, or decide to relocate the plant, or give it some shade. Elsewhere, our camellias are thriving, putting on new growth and now putting on flower buds. Promise of a good camellia flowering season in the coming weeks. 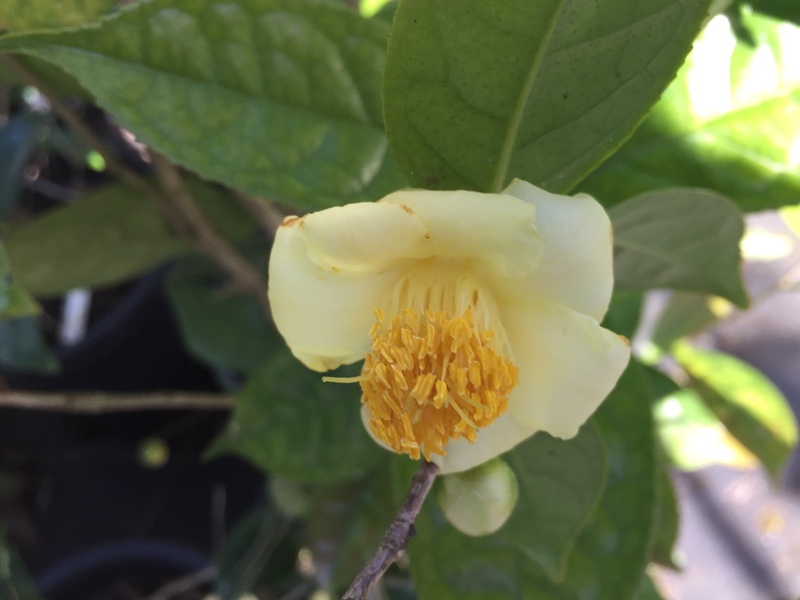 Sasanqua Mikuni Ko – one of our earliest to flower – full of flower buds. Species Crapnelliana and random japonicas and hybrids in the background, Azalea Alphonse Anderson in the front. Posted on January 13, 2019 at 2:01 pm. It’s that time of the year when we are busy going camellia cuttings. Well, we are just about finished actually. 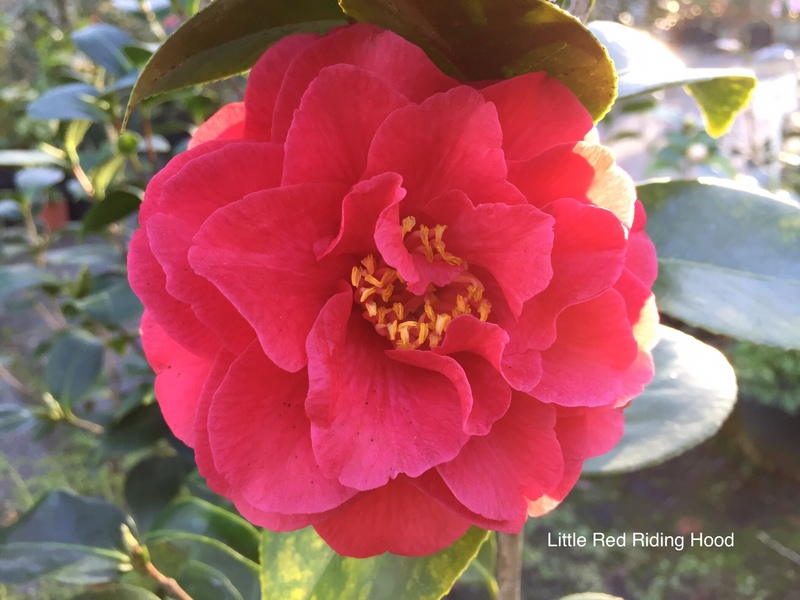 We are holding an demo day for those folk who are interested to see and learn how to do camellia cuttings, cutting grafts, raise seeds et al on the weekend Friday, Saturday and Sunday 18, 19 and 20 January 2019. 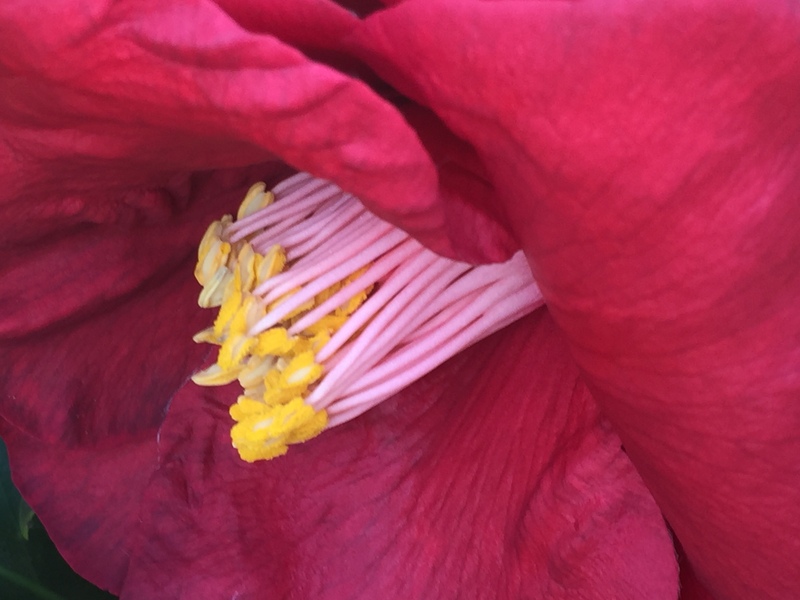 Aimed towards members and friends of the Queensland Camellia Society, we are also inviting other interested folk – we just ask that you call first so we know when to expect you. “It’s camellia cutting time..at Camellia Glen in Palmwoods. 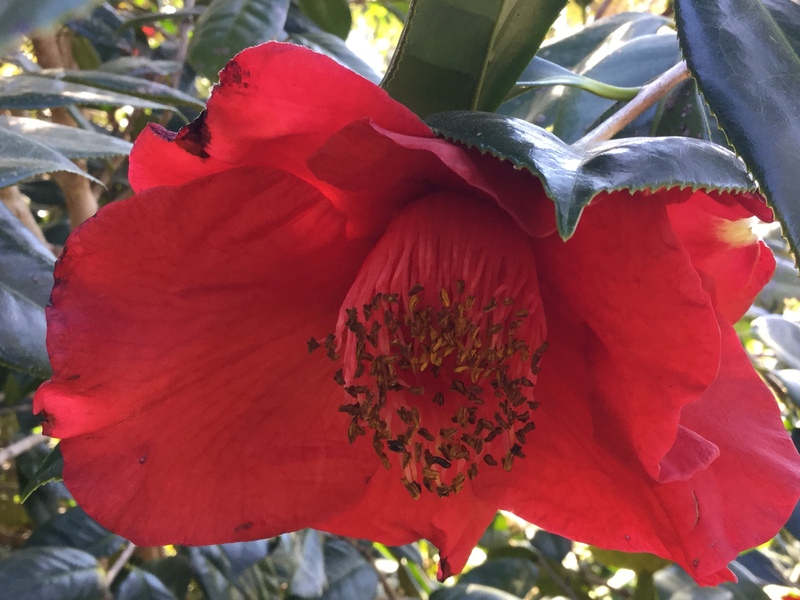 We are holding a cuttings and cutting grafts weekend Fri Sat and Sunday 18, 19 and 20 January 2019 open to all Camellia Society members (and friends). 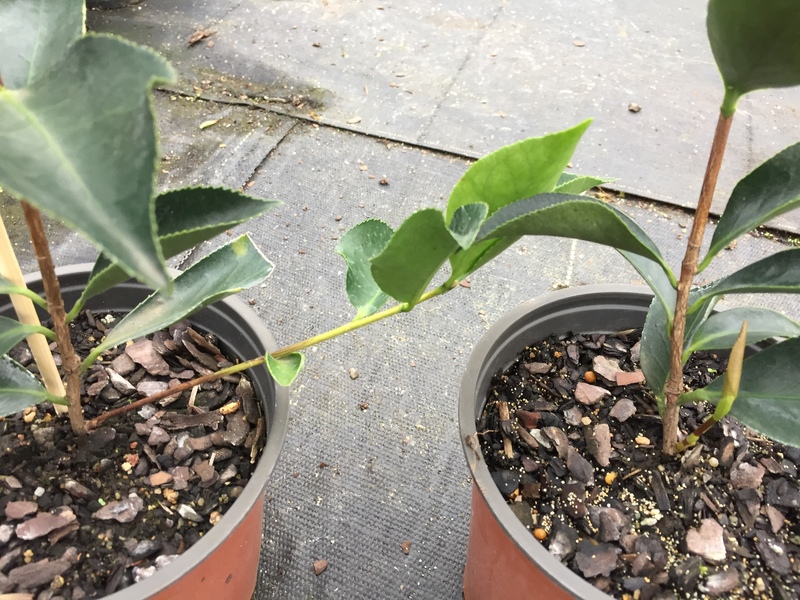 This is an opportunity for you to learn, practice or just watch the process of taking camellia cuttings and cutting grafts. So if you have a camellia that you want to take cuttings off, come along and have a go. Bring along your cutting material or we can supply selected material from our trees. We will supply pots, medium and hormone. 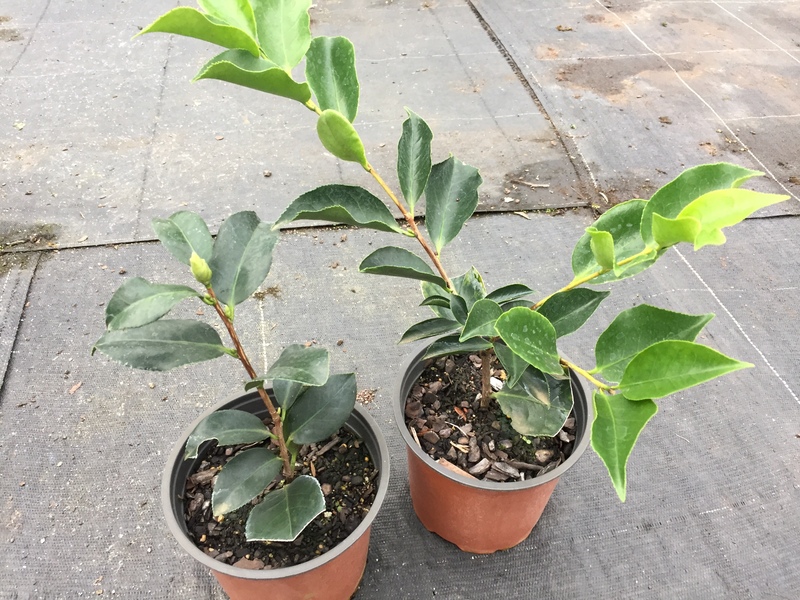 We can show you how to care for your cuttings at home or we can hold your cuttings here in our prop house until the cuttings are struck and ready to pot up. Come and visit – any time between 8.00am to 4.00pm. We will probs have some snags for a bbq at lunchtime, tea coffee or byo stuff. Posted on September 13, 2018 at 11:28 am. 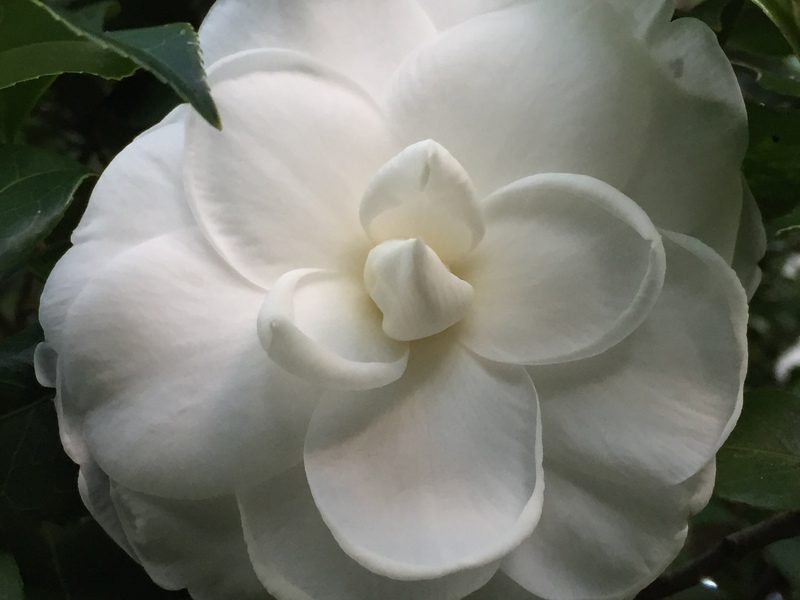 We have been away for the Australia Camellia Society Congress for a few days, but we are back. We have some folk who need camellias and are visiting today, Thursday 13 September 2018 and Friday 14th. Other times, please call 54450333 to make sure we are around. We still have lots of camellias in 140mm pots although most have finished flowering. 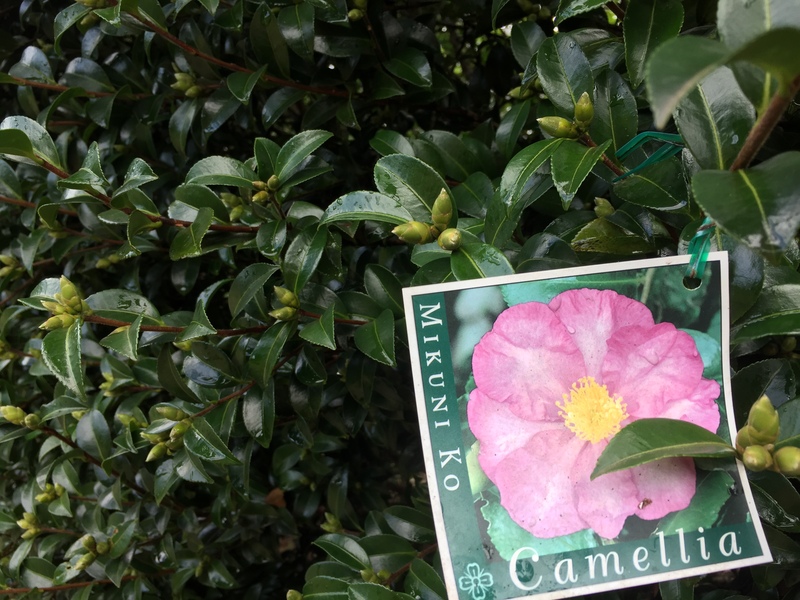 Camellia Hybrid Superscent – we will see if we can get it to grow for us. Posted on September 4, 2018 at 11:35 pm. 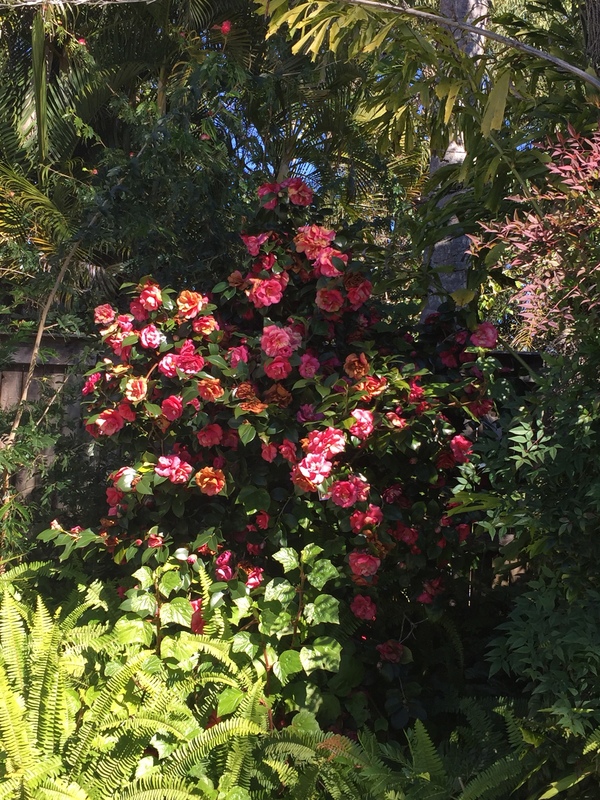 For some, spring is the principal camellia flowering time, so at this time we see lots of camellia shows and bloom competitions around Sydney, Melbourne, Adelaide – the cooler places. And we will be visiting the Camellias Australia National Show later this week in Melbourne. For us in south east Queensland however, our main camellia flowering time was around 4 to 6 weeks ago. This difference just reflects climate differences. Walking around our garden this week, it is quite apparent that all the sasanquas are all done, most of the japonicas are well past their peak with some finished, some still showing a random bloom particularly the late flowerers like Midnight Magic, Cherries Jubilee. The reticulatas are still in full bloom. Also blooming are some hybrids like Nicky Crisp, Tamzin Coull, Gay Baby, Adorable. It it is still dry and the days are getting warm, and this is the kind of weather that is just not good for our camellias. The recent westerlies are extremely drying and this results in our camellias going very soft very quickly due to the drying effect. 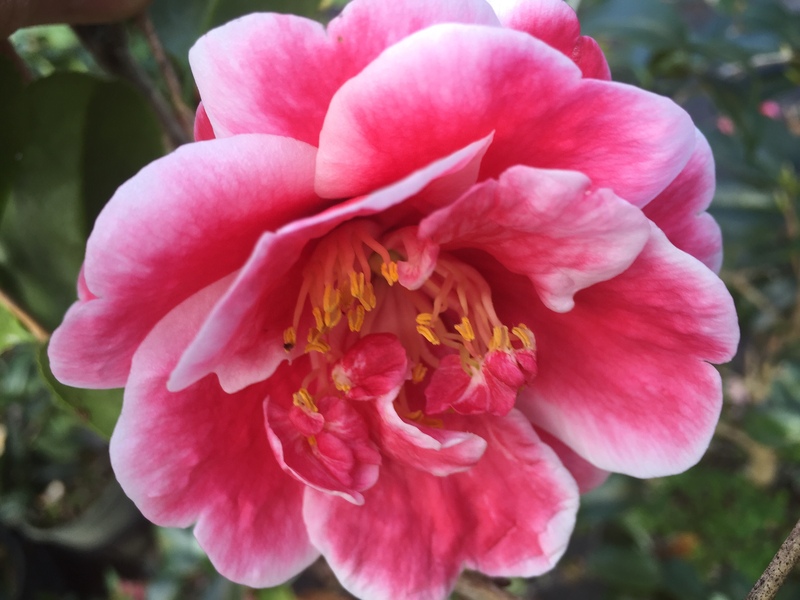 There is not a lot we can do about the weather, but we can choose camellias that suit our climate – and for that reason, we try to stay away from the very early flowering japonicas and the very late flowering ones. So now that flowering is just about done, our camellias will very soon start putting on new growth. In this short window of time, we can start pruning – before the new growth starts. Prune to maintain shape, height, to thin out twiggy non productive bits, to encourage thickening growth on young plants. We can use secateurs, hand pruners or power pruners (my favourite); we can do a light tip prune, a savage ‘hatrack’ cut back, or something in between. Whether we prune or not, depending on what your plants require, early spring is also fertilising time. Again, fertilising before the main growth season will give our plants the best chance to uptake nutrients. 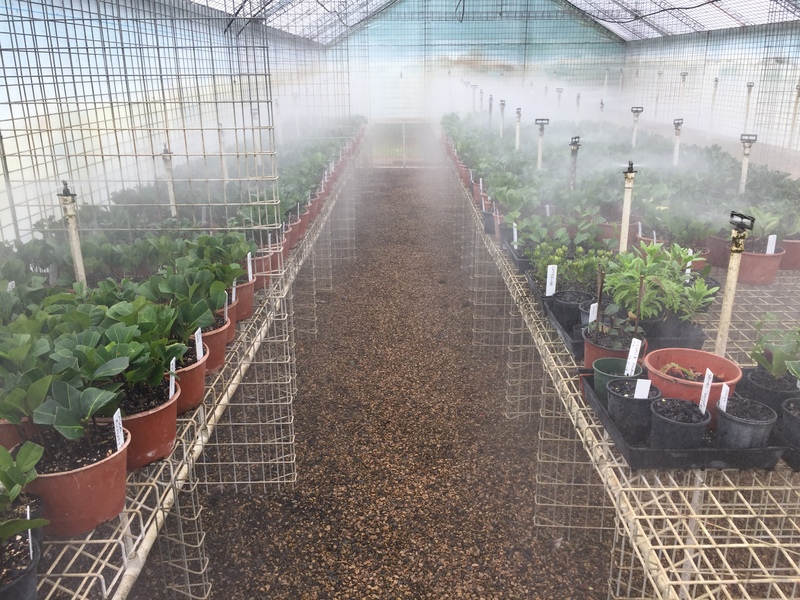 We can use a myriad of fertilizers – from liquid feeds (very labour intensive depending on the number of camellias you have), slow/controlled release prills, blood and bone, Kahoona (from Neutrog) or similar. Don’t be tempted to overfertilise – just don’t. Then mulch, mulch, mulch. Mulch suppress unwanted weed growth, insulates the soil and root zone and retains moisture in the soil. It makes a huge difference. And then we need a good lot of spring rain. Always water after fertilising – so if you can’t conjure up 10 to 20ml of rain on command, then you need to hand water. And not just a sprinkle, a good deep water. 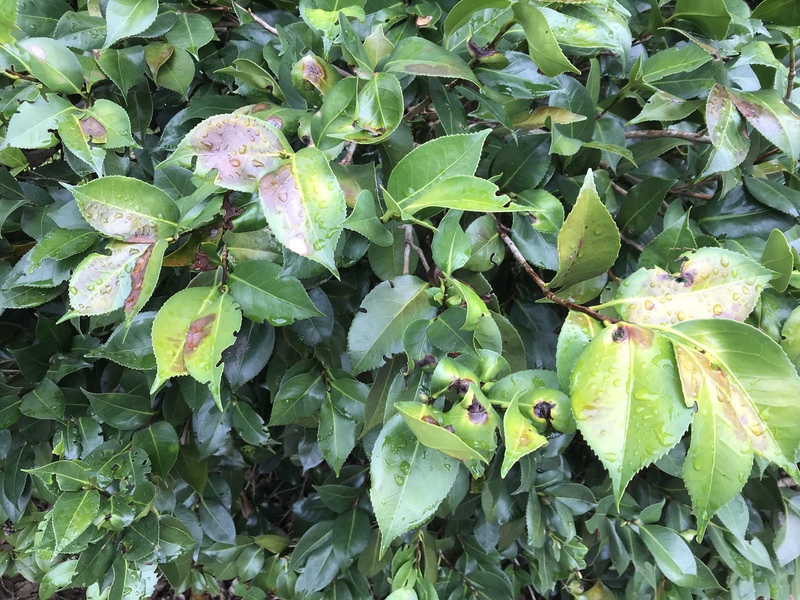 Our camellias are very pest free when maintained in good order, but look for aphids in new growth. Hose them off, lick your fingers and squish them, or use a systemic insecticide if you choose. Flick off white scale if you see them, use pest oil or a combination of pest oil and a systemic insecticide (organic if you can – eg neem oil) if you see tea scale. Look for red spider mite in the upper surface of leaves – usually early summer during a dry spell. This is when you get the bronzing down the centre of the leaf. Use a miticide to break the breeding cycle. From here, hope for summer rain – we had great summer rain last season – and enjoy your garden – in no time at all, the sasanquas will be starting to flower again. Posted on August 8, 2018 at 4:27 pm. This is unscheduled I know, but we have a few folk wanting to come so we thought, why not. We are out of some varieties, getting low on others, but still have lots to choose from – sasanquas for the sun, japonicas, hybrids etc for the shade and part shade. You can still wander our garden; there are still lots of camellias flowering, and the magnolias look great – it is getting a bit dry though. 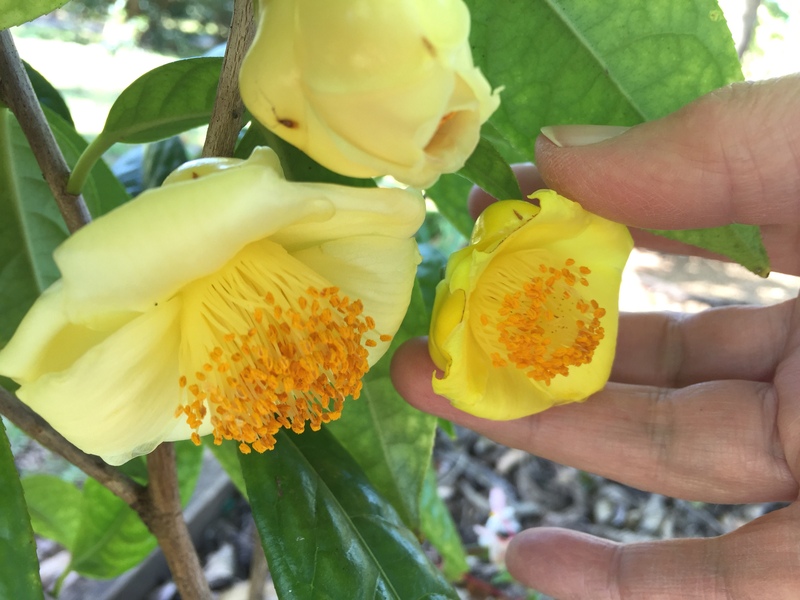 These pics show a couple of the yellow species camellias that are flowering. These are nfs, sorry. Open again Friday 27 and Saturday 28 July 2018. 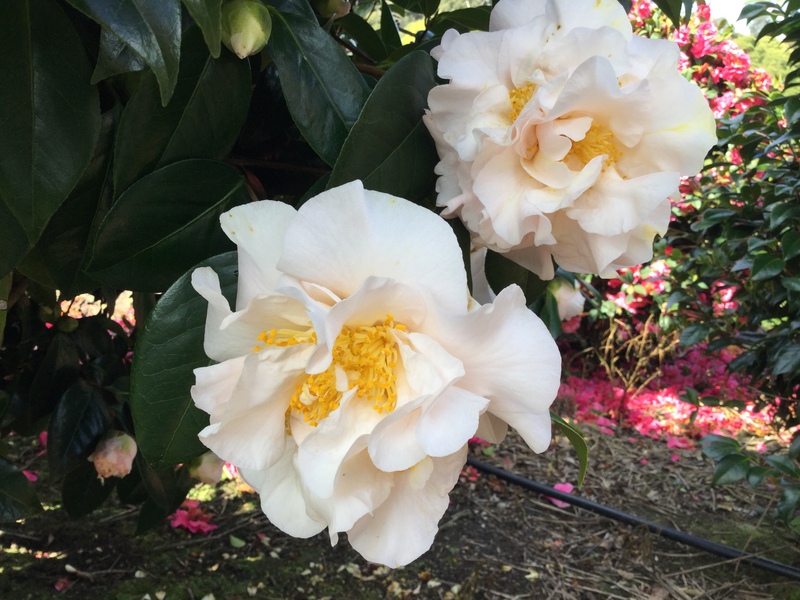 Camellias for sun, shade, part sun, hedges and screens, fragrant camellias, miniature flowers, heritage varieties and collectibles. Posted on July 26, 2018 at 10:35 pm. We will be open at 8.00 am to 3.00 pm both days ….. as usual … and available other times by arrangement … just call in advance to arrange. Even at this stage of our season, we have more varieties than most folk ever get to see. We are running our of some varieties, but we will endeavor to find something that suits. We have lots of sasanquas for those sunny spots, for hedges and screens. These can be shaped and pruned to keep to a height. Some are ideal for low hedges to 1 metre, others will grow 3, 4 or 5 metres. Just ask and we can make a recommendation. Japonicas make a great statement plant for shade and part sun like the striking red of Little Red Riding Hood. 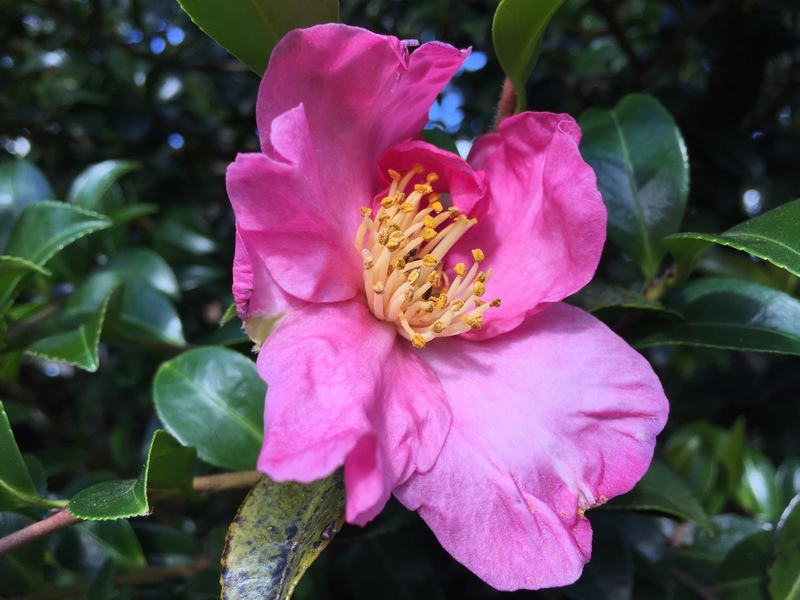 Ask us about the fragrant camellias like Scentuous, Fragrant Pink, Minato no Akebono, Pink Butterfly, species rosiflora, Miyagii, grijsii, lutchuensis. Heritage camellias like Great Eastern and Polar Bear, oldies like Paolina Maggi, higos Kumagai Nagoya and Shiranui, champion blooms like Royal Velvet, Ecclefield, great garden plants Pink Gold, Martha Tuck, unusual camellias Hakuhan Kujaku, Grape Soda, Shikibu, Walter Hazlewood, Alison Norup and Tama Honie (both Tama no Ura seedlings). 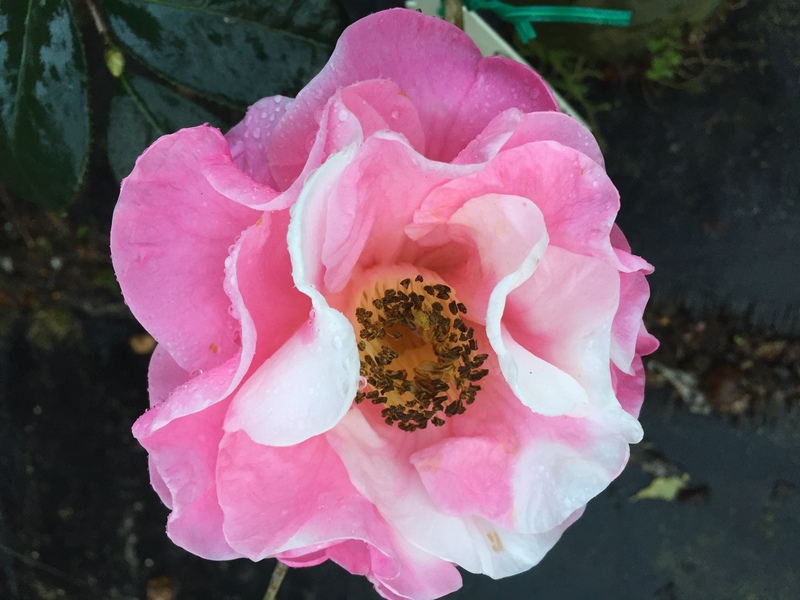 Wander our garden and see hundreds of camellias in flower, and browse through the plants we have for sale. Some of these are getting to find. Posted on July 18, 2018 at 8:24 am. Camellia Glen will be open to the public this Friday 20 June and Saturday 21 June – 8.00 am to 3.00 pm. Our ‘open days’ mean that we are not closed …. 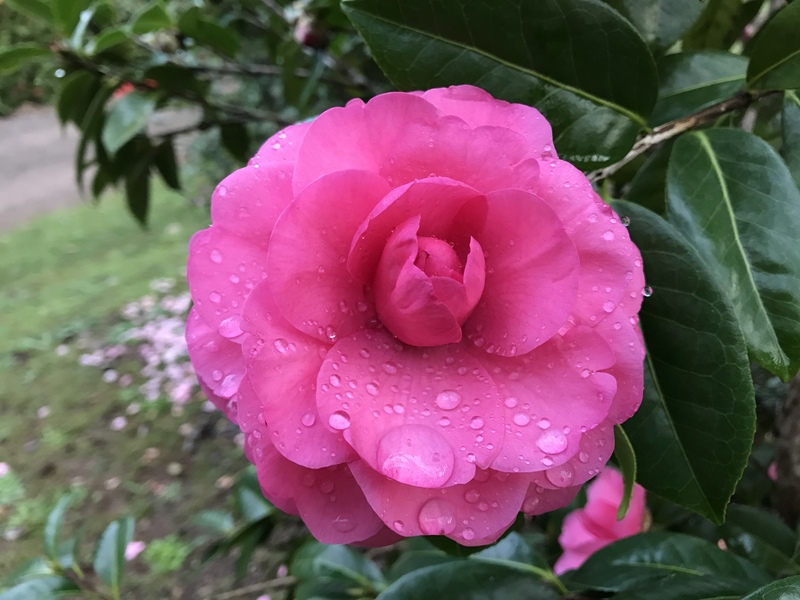 and you are welcome to visit, wander the garden, see our camellias in flower – there are a few hundreds japonicas flowering now – a few magnolias, Vireya rhododendrons. And of course we have lots of beautiful camellias for you to buy. At this end of the season, we are sold out of some varieties, but there are a few hundred to choose from. We even found some nice Reticulata Ellie’s Girl, a Dr Clifford Parks, Francie L. There are lots of the small leaved fragrant hybrids as well as dozens of varieties of sasanqua and japonica. 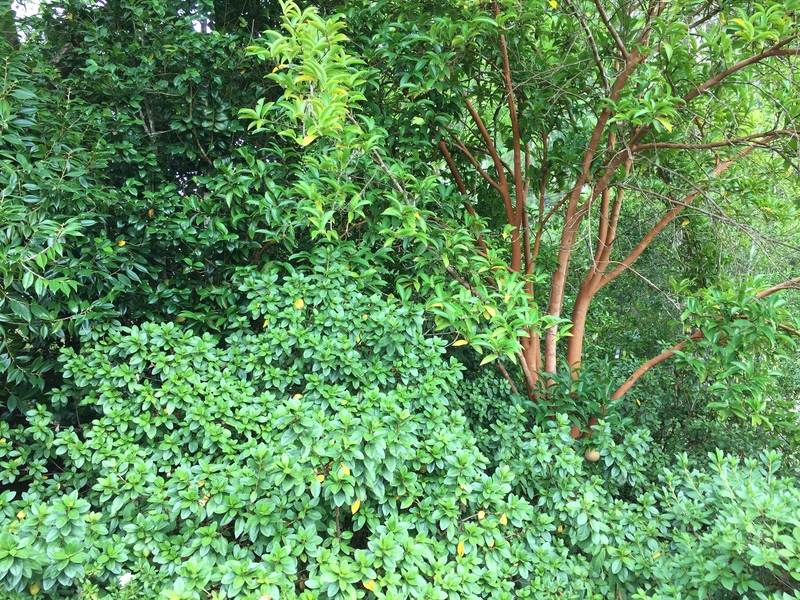 Here in SE Queensland, we always recommend that japonica camellias flower at their best in part shade…… and someone will say that their camellias are in full sun and are just fine. It’s a matter of expectation. If you expect your flowers to last only a day or two before they burn, then you will not be disappointed. This Great Eastern in our garden gets morning sun. From a distance it is full of colour; the closer you get, the more you see the sunburnt flowers. But there are always the ones on the other side of the bush. Great Eastern gets a fair bit of morning sun. Looks full of colour and pretty good from a distance.